In August, 1888 Vincent van Gogh began painting a series of works which, as Dr. Jan Hulsker suggests "perhaps more than any other of his paintings, have made him known throughout the world. They are often the only works with which he is identified. "1 This series is, of course, the sunflowers. 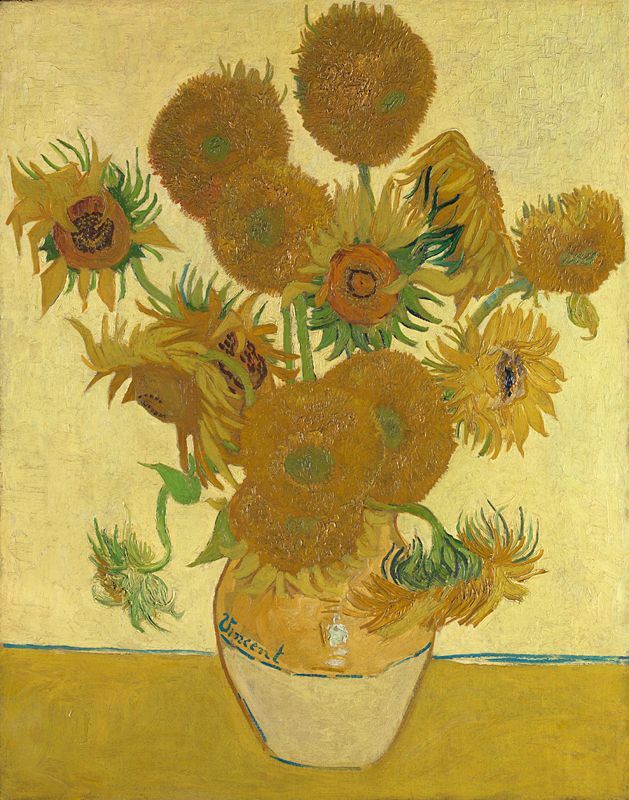 Van Gogh envisioned his sunflower works as a series and worked diligently on them in anticipation of the arrival in Arles of his friend, Paul Gauguin. In a letter to Emile Bernard written around 21 August 1888 Vincent wrote: "I’m thinking of decorating my studio with half a dozen paintings of Sunflowers. A decoration in which harsh or broken yellows will burst against various blue backgrounds, from the palest Veronese to royal blue, framed with thin laths painted in orange lead. Sorts of effects of stained-glass windows of a Gothic church." (Letter 665). Vincent eventually planned a dozen sunflower works to be hung in the Yellow House which he and Gauguin would use for a studio. "I’d like to do a decoration for the studio. Nothing but large Sunflowers. Next door to your shop, in the restaurant, as you know, there’s such a beautiful decoration of flowers there; I still remember the big sunflower in the window. Well, if I carry out this plan there’ll be a dozen or so panels. The whole thing will therefore be a symphony in blue and yellow. I work on it all these mornings, from sunrise. Because the flowers wilt quickly and it’s a matter of doing the whole thing in one go." (666). Unfortunately, Vincent's race against the changing seasons was unsuccessful and he was only able to complete four sunflower works in August, 1888. After Van Gogh's mental breakdown late in December in 1888, he would go on to paint three additional copies (F 455, F 457, F 458) of the original four sunflower works. Sunflowers (Helianthus annuus) are an annual plant native to North and South America. The species includes more than thirty varieties including "Orange Sun" and "Taiyo." The large, puffball like specimens seen in Van Gogh's paintings are known as the "Teddy Bear" variety. 1. Jan Hulsker, The New Complete Van Gogh: Paintings, Drawings, Sketches, (p. 352). On loan from 1917 until 1920. Tate Gallery London United Kingdom 1924 Courtauld Fund.